Click here to download a PDF of this manual in printer friendly form. The Twelfth Doctor’s Sonic Screwdriver was originally fabricated by the TARDIS for the Eleventh Doctor after the Tenth Doctor’s screwdriver was completely destroyed. Apart from being bigger than the Tenth Doctor’s one, it differs from the previous model in shape, power, its distinctive glowing green tip and extending clasps. The Wand Company have created this prop replica Universal Remote Control version specially for Earth use. It has been simplified so as not to cause danger to human operators, while still being a very powerful and useful device capable of controlling almost all types of home entertainment equipment. To avoid confusion and potentially chaotic usage, this model has had its psychic control interface disabled. However, humans will still be able to access its full range of functions after studying the information presented here in this manual leaflet. This Sonic Screwdriver universal remote control is not a toy: it is a device for remotely controlling home entertainment equipment such as TVs, DVD players, Blu-ray players and iPod docks, using infrared codes learned from conventional remote controls by the means of gestures rather than by pressing buttons. A total of 13 different gestures and three separate memory banks enable it to learn up to 39 remote control functions. In FX Mode, the Sonic Screwdriver produces 12 different sonic buzzes, beeps and scanning sounds from the universe of Doctor Who, all at the press of a button, and has the power to instantly turn off almost any TV without any set up required. This Sonic Screwdriver is not only a remote control, but is a reproduction of the Twelfth Doctor’s Sonic Screwdriver, fabricated from die cast metal, acrylonitrile butadiene styrene (ABS) and soft-touch, leather-effect, thermoplastic polyurethane (TPU). In FX Mode a long button press makes the Sonic buzz and lights the tip for as long as the button is pressed. Pressing the button and doing gestures does not send any IR codes. A double-click press, where the second press is held down, allows the user to access a range of different Sonic sounds. 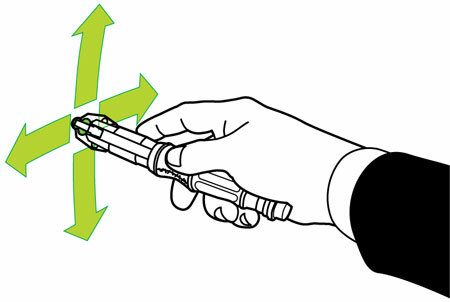 As long as the button is held down after a double press, each time a gesture is performed correctly, the Sonic plays one of eleven more sonic screwdriver sound effects. 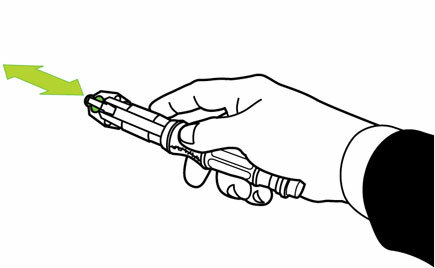 In FX Mode the Sonic Screwdriver does not power down automatically after 30 minutes, but after few seconds in its stand it starts to flash its tip briefly, about once every two seconds, indefinitely. 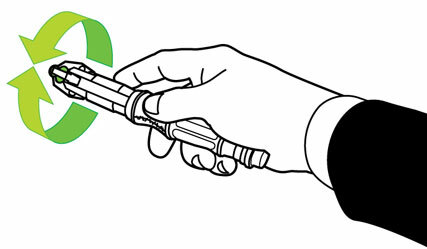 After two minutes without any movement, the Sonic Screwdriver runs a quick diagnostic routine then the tip flashes and it transmits a Morse code message to confirm that it is OK. For as long as it remains motionless, every 1963 flashes it transmits one of 12 different Morse code words and phrases that it has heard the doctor speak. Pressing the button with three short presses while in FX Mode switches to silent Morse code transmission; a further three short presses turns the Morse code sound on again. 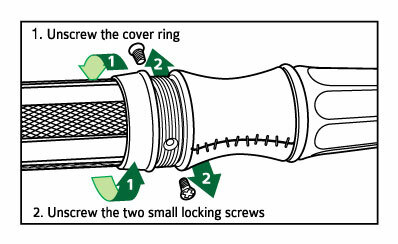 The Sonic Screwdriver can be locked to stop unauthorised use. To lock the Sonic, press the button four times quickly and enter any three-digit Lock Code at the spoken prompt. To enter the desired three digit Lock Code, press the button rapidly to count out the first number then pause for the Sonic to confirm it. Repeat the process for the second and third numbers of the Lock Code to be stored. 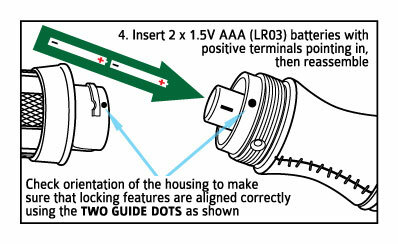 As soon the Lock Code has been entered, the Sonic will power down and lock itself. 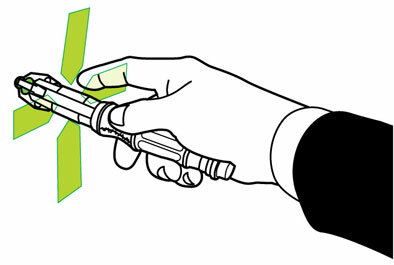 The Sonic Screwdriver will then need to be unlocked by entering the correct code each time it is powered up. In the event that the Lock Code is forgotten, it may be erased completely by taking the batteries out and putting them back in again. (This does not erase any of the learned IR codes). The Lock Code can be erased and locking can be disabled, by pressing the button quickly five times whilst the Sonic is unlocked. Fit the tail of the Sonic carefully into the Gallifreyan text stand. Take care not to push it too forcefully into the stand. If the Sonic is in FX Mode, while motionless on the stand, after ten seconds its tip will start to flash and after two minutes it will transmit a Morse code message to confirm that it is OK, and then every 1963 flashes (about one hour) it will transmit one of 12 of the Doctor’s well-known words and phrases. The Sonic can be extended by approximately 30 mm. The Sonic may be extended either by gripping the knurled grey parts of the upper cage and pulling it away from the handle, or by carefully flicking it. When extending the Sonic, do not force it past its fully extended position. The Sonic is heavy so take extra care when flicking it. Do not hit anyone or anything with it and make sure that you keep a tight grip of the handle so as not to let go of it and damage the Sonic or injure someone by accidentally throwing it. 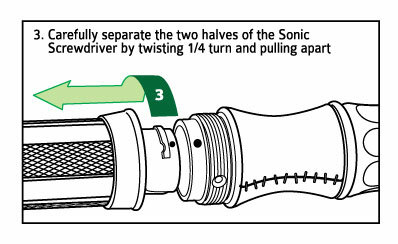 To retract the Sonic, hold the Sonic by the handle in one hand and close the clasps with the other hand, then while holding the clasps closed, push the front of the Sonic back towards the handle until it is fully retracted. Please note, the Sonic is only designed to function as a remote control when retracted. This Sonic is a sensitive instrument of control and should be handled with care. Do not bend or stress the Sonic while extended; clean only with a soft, slightly damp cloth; do not immerse in water. To protect the Sonic while not on display, keep it safely in its merchandising box tray. In FX Mode, a double press where you hold the second press down allows you to access 11 other sonic sounds. As long as you hold down the button, a different sound will be played for each gesture you do.